Bonus: It could also help save the Earth. For decades now, the people at SETI (Search for Extraterrestrial Intelligence) have been scouring the skies looking for evidence that suggests the universe is occupied by beings other than humans. Besides a few promising mysterious signals (most famously, the “Wow! signal” that was detected in 1977), the search has largely come up empty handed. If intelligent beings exist, where are they? Why aren’t we picking up their radio signals? Are they picking up ours? If they are out there, could it be that we’re just not looking in the right place? Is it possible that we have discovered signals of alien lifeforms, but just don’t recognize them for what they truly are? One way to answer these questions may be Dyson spheres. In case you need brushing up on your sci-fi, a “Dyson sphere” is a hypothetical massive set of solar panels that would surround a star, collecting a vast amount of the star’s energy output. And as we are all probably well aware, stars put out a lot of energy. Thus, any intelligent civilization (see: super-intelligent civilization) that is able to create a Dyson sphere would likely be provided with all of the energy it could ever need. In all likeliness, a highly advanced society would be a highly advanced technological civilization. We don’t know this for sure, but it is a reasonable assumption, as you need technology if you hope to ever leave your own planet. To that end, the society would be heavily dependent on energy, just as we are. And a Dyson sphere seems like the most logical endpoint for such civilizations. This is because Dyson spheres (theoretically) shouldn’t have any of the pollutants that other forms of energy production have. There will be no smog from fossil fuels, no greenhouse gases, no habitat destruction from mining, and no nuclear meltdowns. Because of all of these benefits, Marcy thinks that the Dyson sphere is where most technologically advanced societies are headed. So, in the search for alien life, it makes sense to look for s Dyson sphere. However, if a Dyson sphere completely encompasses a star, soaking up all of its energy output (meaning that little to no light escapes), how would we go about finding one? Stars give off all sorts of things besides visible light; heat is just one of them. The Hubble Telescope and the Spitzer Space Telescope are equipped with several tools that can capture ultraviolet light, infrared, and x-rays…along with visible light (obviously). If we spotted a section of the cosmos where a Dyson sphere was in use, we would likely see something like a blackbody object that’s radiating in the far infrared around 10 microns in wavelength. A perfect blackbody is a theoretical construct that, among other things, is a perfect absorber (meaning that it absorbs all wavelengths equally and perfectly). 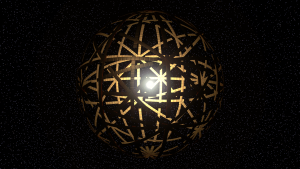 A Dyson sphere, which is meant to absorb all the light of a star, would be (in essence) a blackbody. However, if these perfect absorbers just kept on absorbing everything around them, they would get hotter and hotter and eventually they’d get infinitely hot. That can’t happen, which is why a perfect blackbody is just a theoretical construct. In reality, blackbodies (the non-prefect type) just emit proportional to their temperature. Of course, this means that blackbodies actually aren’t black. In fact, a star isn’t a perfect blackbody, but it’s pretty close, because any photon that hits a star is absorbed completely, and the emission from the star’s surface primarily depends on its temperature. But stars are not black; you see them. All matter in the universe glows in some form of light, from gamma rays to radio waves. More of certain kinds of radiation are given off than others, more things in the universe peak in the radio or infrared areas than gamma ray light. Since our eyes aren’t biologically sensitive to those kinds of light, we don’t “see” anything. So as previously mentioned, if we detected a Dyson sphere, the star would be radiating light in a blackbody spectrum that’s captured by the Dyson sphere, and released back out in the far infrared around 10 microns in wavelength at a distance of 1 AU (the average distance from the Sun to the Earth). The blackbody temperature for the region would be about 100 to 600 Kelvin for a full or partial Dyson sphere. Now, detecting an area of our galaxy that has the signature mentioned above isn’t a sure fire sign of a Dyson sphere being used by an alien race, but it would have some interesting implications. The major point being that we need to open our minds a little bit further and take an nontraditional approach in our search for extraterrestrial intelligence. So far, the methods we’ve been using aren’t providing us with anything. Perhaps we are in dire need of changing the way we envision what an alien intelligence might be? If we ever find them, it isn’t likely that they’ll meet the preconceived notions we have of them. That may ultimately be our downfall.